This document is currently maintained by Philip Brohan (philip.brohan @ metoffice.gov.uk). All criticism should be directed to him - put please don’t send email, raise an issue instead. This document was written by Philip Brohan (Met Office). He was funded by the Joint DECC and Defra Integrated Climate Programme, DECC/Defra (GA01101). The (pre-release) 20CRv3 data used were provided by the Twentieth Century Reanalysis team, led by Gil Compo. 20CRv3 is being run at the National Energy Research Scientific Computing Centre (as was 20CRv2c). As well as compute capacity, NERSC provide the data archive and access. Observations used for validation come from the DWR dataset. 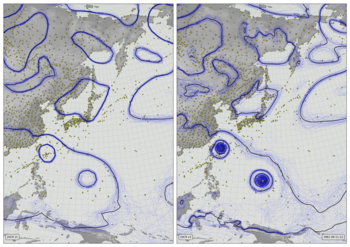 Software used includes IRData for data access, Meteographica for weather maps, and SciPy. Note that appearance on this list does not mean that the person or organisation named endorses this work, agrees with any of it, or even knows of its existence.